I went to Alaska last week. 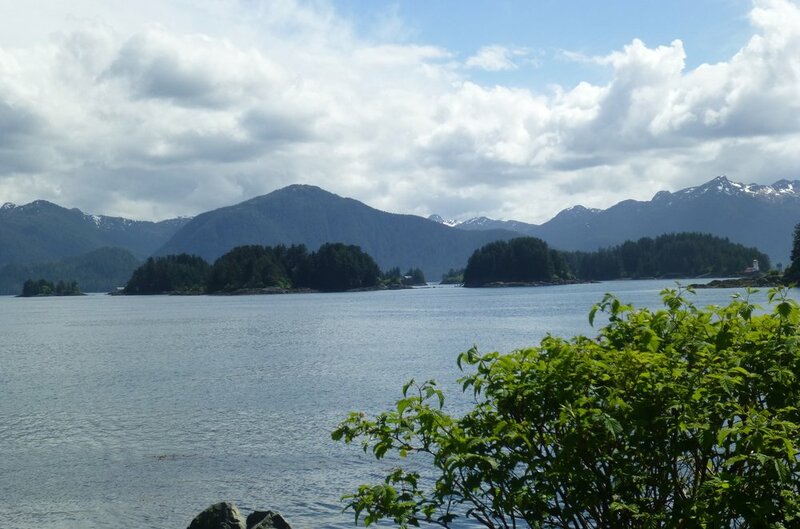 More precisely, I went to Sitka with my daughter, who was there for work. I had never been to either place and quickly learned to love them both. Sitka has a population of about 4,500 and it felt good to be back in a small town again, where traffic was minimal and the pace was easy. While Jennifer was in meetings I wandered the streets, walking from one end of town to the other, visiting historical monuments and doing my share of eating, etc. Sitka was once the heart of the Russian fur trade and the Russian influence remains, mostly in the startling variety of matryoshka dolls for sale, but also manifest in the old St. Michael's Orthodox Church and the Bishop's House. It was a touch of old Russia that I hadn't realized I missed. Equally at home were the Alaskan natives and their remarkable art. This cultural variance keeps the little town vital and interesting in ways most homogenous places aren't. The highlight of the trip for both of us was the three-hour private tour of the bay and its beautiful islands. Besides the scenery, which would have been enough, we saw a humpback, a minke, otters, seals and sea lions, and probably more than fifty bald eagles, though we had ceased counting them days before. They were everywhere. We talked a lot about what it would be like to live in such a place and agreed that we would love it except for the weather, which consists mostly of rain and even in the summer doesn't get above 60 or 65. But there is peace in the landscape, and wonder in the wildlife and the call of Alaska is real. As our plane rose over Baranof island I waved goodbye to the fishes and pledged to return again one day. WRITING HERE A year ago I cited T.S. Eliot's famous line, "April is the cruelest month" while complaining about the constant rain. This year is no different. Each morning I check my weather app hoping to see sunny skies in the future, and each morning I see rain predicted ten days hence. I think I should stop doing this. My new life continues to evolve and the days have taken on a kind of habitualness that has the benefit of filling the hours, if nothing else. My concentration has improved enough that I can now sit for a half hour with a book without reading the same sentence endlessly, or battling the omnipresent urge to do something else. Even the news doesn't hold much interest, and for a news junky that is weird. But the president and I have this in common; we are both living through a depressing year. The difference is, he doesn't know it. So what have I learned so far from this year of bereavement? I have learned that by flitting from one task to another a lot can be accomplished. The satisfaction of actually finishing something, however, is lost. I have learned that yogurt can be eaten for breakfast, lunch, and dinner; that errands can be put off indefinitely; and that the body can produce an endless amount of tears. Thanks to my grief counselor I have learned that talking to yourself out loud is neither unusual nor a sign of imminent dementia. This was a relief. I have learned that I can still laugh out loud, still enjoy friends and outings, still look forward to events, while holding a sadness in my heart. I am impressed with the flexibility of my heart, how it makes room for boundless love and seemingly endless grief. If the rest of our bodies were as flexible as our hearts we would all be made of rubber. Despite the evil and suffering that fills the world, I still believe we have within us the power to change. In ways big and small that is happening every day. And maybe my grief is its own wake up call. Today, life without Ray feels empty and meaningless. But I know in my flexible heart that more awaits, and that the years ahead will confirm what I've always known, that all life is a gift. March is Women's History Month and today is International Women's Day. I've spent the morning vacuuming and dusting and cleaning up the kitchen, because Laura is coming for tea. I had thought of honoring women in my family this month, for women's history is essentially the history of our families. There are many I could draw on, from the those who supported the underground railroad, to the sisters who fought for women's rights along side Cady Stanton and Susan B. Anthony. Closer to home I could write about my paternal grandmother, who raised eight children on an Oklahoma homestead and wrote poetry, and kept a pet pig that she washed every laundry day in the big cast-iron cauldron that now sits in Jennifer's living room, full of throws. I met Alice Hedglin Coffin only a few times and most of my memories are of tales others told. Like the time she found a large rattlesnake asleep on the floor of the parlor. Alice grabbed the shotgun that was always nearby and threw it over the snake. Then she planted a foot on each end of the gun and called for help. A son soon appeared and cut the snake's head off. Then he asked, "Why didn't you just shoot it?" because Alice was as good as any man with a gun. "Because I didn't want holes in the floor!" she replied. Which always made sense to me. In the end though, I decided not to write about family; that can wait for another time. Today I want to honor the women who too often go unsung and underpaid. I had the good fortune to know several over the last months of Ray's life. Sometimes they came when called, like Siri, who lived down the hill and filled in when others couldn't make it. Sometimes they came for an hour or two a week, like the nurses; or twice weekly, like the bath aides. And sometimes they were there every day. One of these, Laura, was with me the longest, eight hours a day toward the end. Laura had worked with dementia patients for nine years, and with those in hospice for the last six. She was knowledgeable, competent, kind, and loving. She cooked scrambled eggs for Ray, with the hot peppers he loved. When he could no longer hold a spoon she fed him, and when he could no longer eat she gave him hourly doses of morphine to ease the pain of inevitable bed sores. We bonded over dirty diapers and strong cups of green tea. I heard about her extended family and the traditions of her Mexican roots, and she heard stories of our travels and my highly opinionated views on politics. I could not have gotten through the last months without her. Most women become caregivers at some time in their life, but few make careers of it and those few—there may be millions in the US alone—deserve our respect, decent pay, and even honor. I keep thinking about the President, who wouldn't give Laura, a Chicana, the time of day. He might even want her deported, despite being born in the U.S. But Laura and those like her who spend their lives caring for others are worth far more than a thousand Trumps. So today, on International Women's Day, I'm happy to honor them. And I'm also happy because Laura is coming for tea. WE'VE HAD SNOW here for three days—not much, about four inches. But it froze overnight and that kept me at home. Today it's starting to melt so I ventured out and picked up my husband's death certificate. There's a finality about seeing those words tied to Ray's name on that official state-sanctioned form. It's a relief in a way, an undisputed acknowledgement that there's nothing I can do now. No medicines, no words, no supplications can bring him back. He's gone and I'm still here and life goes on. I've a document that proves it. And I'm glad to be alive this week to applaud the energy and determination and strength of the students from Marjory Stoneman Douglas High School. It's a marvel to me that these students, suffering profound shock and grief, have summoned the willingness and drive to confront this long-standing issue. My husband died peacefully at home. These children saw their best friends torn apart by the bullets of an AR-15. That they had the courage to stand up and say "no more" just hours after the event, well, I haven't the words for it. We are living through a kind of crucible in this country. So much has happened that we never thought to see. But I rejoice in the power of so many resisting the onslaught of corruption and ignorance. People are standing up, fighting back, speaking out. And the year is young. We mustn't waste a minute of it.